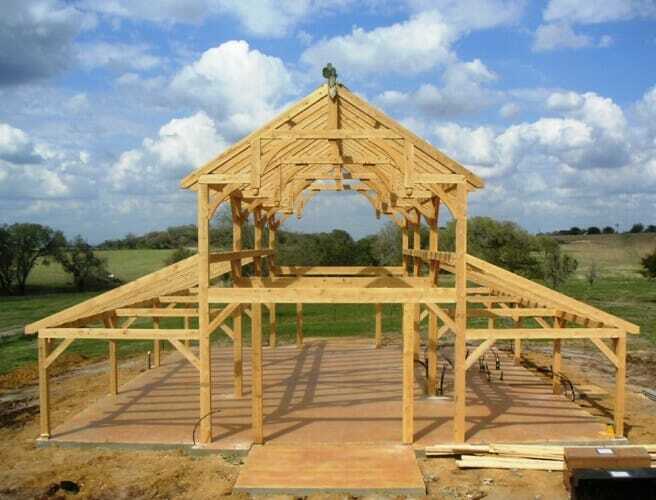 What is the widest span you can build with timber frame for the Texas barn in the center part of the barn? Mostly it depends on snow and wind loads. Where are you building the barn? A typical wide width is 40 feet, we have gone up to 66 feet, and have built octagons that are 80 feet across. As you go further, the design becomes more complex and the costs go up. Forty feet span with a 12’ to 14’ grid is a good place to start. Looking to store my toys, tractors, 40 RV, ATVs, Snowmobiles and have room for open space and shop all on the first floor. Want the highest garage door possible! Our please is in Windham Vt in Timber Ridge. Thank you for your interest in this barn! If you want to give us a call at our workshop at 802-886-1917, one of our sales rep can answer all of your questions and speak with you about your project.